Donald Trump questions Obama's claim that Muslim sports heroes exist. 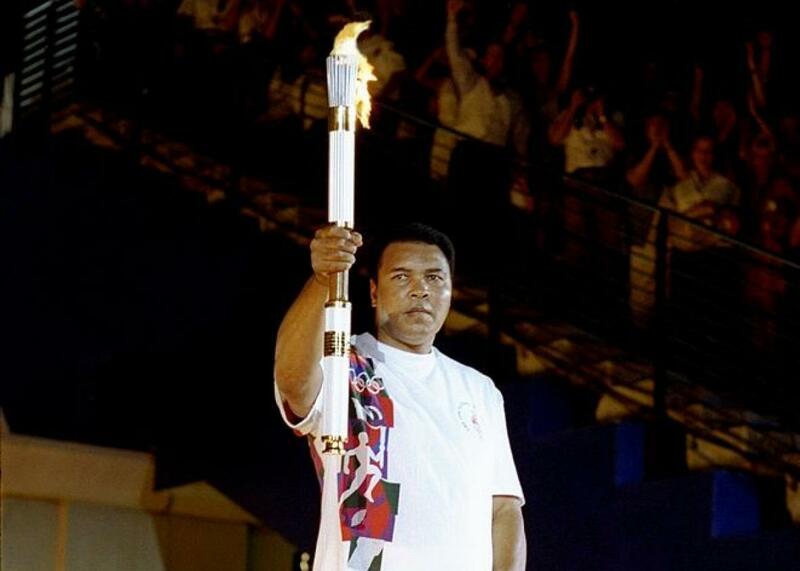 Muhammad Ali prepares to light the Olympic flame during the opening ceremony of the 1996 Olympics in Atlanta. It’s our responsibility to reject proposals that Muslim-Americans should somehow be treated differently. Because when we travel down that road, we lose. That kind of divisiveness, that betrayal of our values plays into the hands of groups like ISIL. Muslim-Americans are our friends and our neighbors, our co-workers, our sports heroes. And, yes, they are our men and women in uniform who are willing to die in defense of our country. We have to remember that. Leading Republican presidential candidate Donald Trump was skeptical about one of those claims in particular. As many, many people immediately pointed out, Trump appeared to have forgotten that the man who at least at one point was the world’s most famous athlete, Muhammad Ali—who was chosen to essentially represent the entire United States by lighting the Olympic flame the last time the Summer Olympics were held here, in Atlanta in 1996—is Muslim. As are basketball legends Kareem Abdul-Jabbar and Hakeem Olajuwon and many other past and present stars.